When I was a little girl, before the house move I mentioned last week and over twenty years ago, I begged my Mum to paint my bedroom pink. I can’t remember my exact age at the time (I’m sure I’ll get a fact-confirming phone call or email from my Mum as soon as this post goes live) but I do remember pink being the talk of the playground, my absolute favourite and the go-to colour of choice for everything from pencil cases to t-shirts to bedrooms (and everything in between). Painting over the alphabet frieze that had previously adorned the walls felt like a seriously grown up move, one that required consideration and planning in terms of picking out paint, covering the contents of the room in dust sheets and setting aside precious time to do the job properly. I thought about it long and hard. My Mum lovingly painted the room. And as soon as it was done, with the fickle flippancy that only a small child can even begin to get away with, I told her I didn’t think I really liked pink all that much any more. My pink phase, as that of most little girls tends to do, had passed. Last week I was at the greengrocer when a basket of rhubarb caught my eye. Despite bad experiences with stringy school rhubarb, that gloopy grey sludge a little more akin in colour to unwashed socks than anything else, the little girl in me was drawn to the shocking pink stalks before my eyes. Pink, it seems, still has a place in my heart. The recipe below combines beautifully pink forced rhubarb with spicy stem ginger in a jam that is both comforting and zingy, spread below a delicate frangipane and encased in a flaky pastry crust. Here I’ve added a little wholemeal spelt flour to the dough for flavor and texture, but you could easily use all plain. Just don’t omit the orange zest, it really brings the dish to life. Next time I cook rhubarb, I’m going to try cutting back the sugar, making more of a compote with a little bit of cardamom and maybe even a hint of rose, and serving it swirled into thick homemade yoghurt. But for now, in this cold January weather, pastry and sugar and the warming spiciness of ginger are exactly what I want. And pink. Everyone needs room to appreciate a little bit of pink in their lives now and again. Sharp forced rhubarb, sweet frangipane and flaky orange-scented pastry make these little tartlets the perfect January treat. The recipe for jam makes a little more than you will need, but it's delicious swirled through creme fraiche and served on the side, or eaten the next day spread on toast. The rhubarb needs to sit for a few hours before cooking to allow the juices to come out, so make sure you allow for this in your timings. 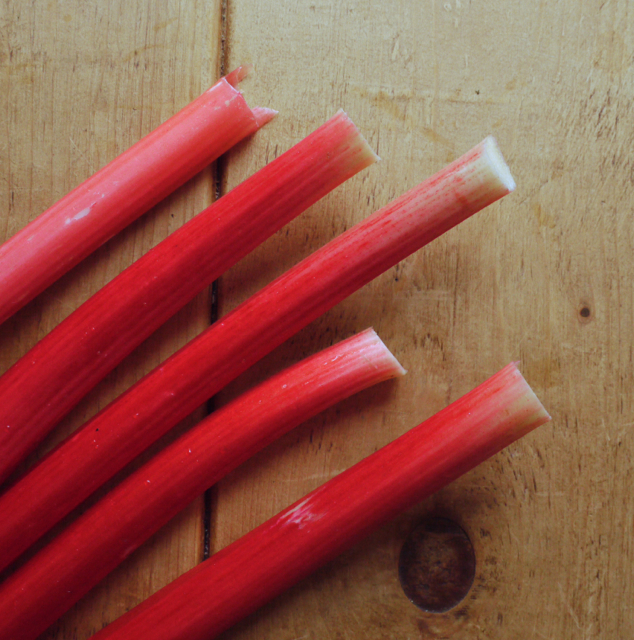 To make the jam, cut the rhubarb into 2cm slices. Add a few pieces to a heavy bottomed saucepan, sprinkle over some sugar, then repeat in layers until all the rhubarb and sugar is used up. Pour over the lemon and orange juices, cover and set aside for a couple of hours, preferably overnight. This draws the juice out of the rhubarb, helping to create a more syrupy jam. The next day, bring the rhubarb and juice mixture to the boil, stirring gently without breaking up the pieces. Add the ginger, boil for about 5 minutes then test for the setting point using a thermometer - it should read 105 degrees C. You can also test dropping point using a frozen spoon. Remove from the heat and set aside for 5 minutes before pouring into a warm, sterilised jar (or jars). To make the pastry, beat the butter and sugar together until just smooth in a medium bowl, about one minute. Add the egg yolk and mix til combined, then add the flour, salt and orange zest, mixing until the dough just comes together. Press into 6 individual 9 cm tartlet tins with a removable base, prick the base of each with a fork and freeze for one hour. Preheat the oven to 190 degrees C. Remove the pastry cases from the freezer and bake for 5 minutes (no need to line with beads). If the pastry has puffed up slightly, pat it flat with the back of a spoon then bake for a further 8 minutes, until lightly golden. Remove from the oven and turn the temperature down to 180 degrees C.
To make the frangipane, cream the butter and sugar together. Beat in the eggs one at a time, adding a little flour if necessary to prevent the mixture from splitting. Once smooth, fold on the ground almonds and remaining flour. To assemble the tartlets, spoon about 20g (a very heaped tablespoon) of jam into the bottom of each pastry case. 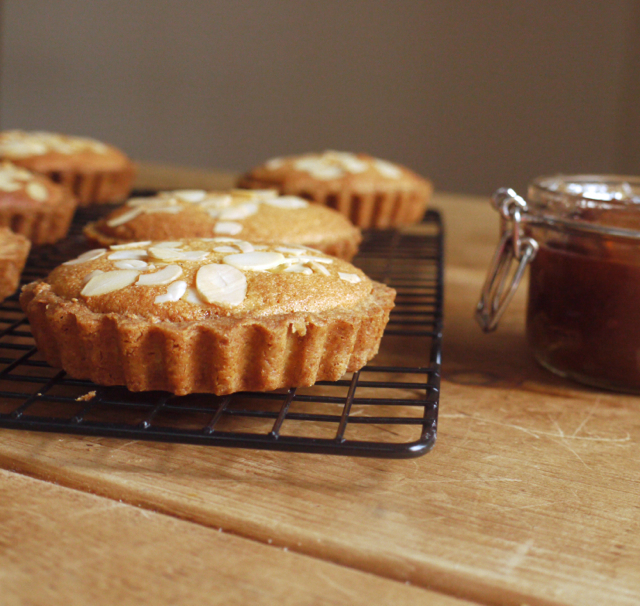 Divide the frangipane between the six tartlets and smooth at the edges so no jam is showing. Scatter with flaked almonds and bake for 20 - 25 minutes, until golden and risen. Remove the tarts from the oven and allow to cool. I served them warm for pudding with raspberry compote and vanilla ice cream, but they're also delicious on their own as a tea time treat. Making this jam is fairly straightforward but I am by no means a jam-making expert. For more detailed instructions on all sorts of jams and preserves plus handy hints on setting points etc, I highly recommend the River Cottage Preserves handbook. Absolutely beautiful, and delicious. Love the change in flavour combination. It’s very rare to see anything other than a standard bake well tart. “6 individual 9 inch tartlet tins” – I think this is a mistake. Really fancy making these. Any chance you could clarify? Obviously when I say 9 inches I mean 9 cm . . . eek! So sorry about this, major typo. Have updated now, thanks for the spot. 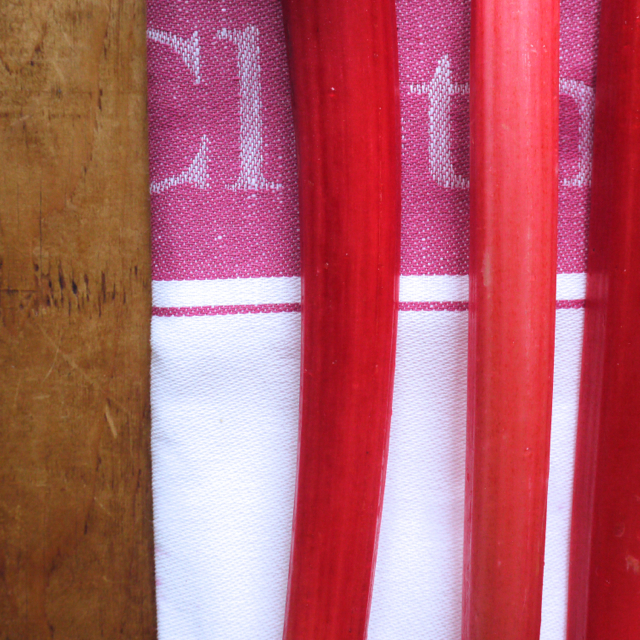 I do so love that bright vivid pinkness of forced rhubarb – so much better than its summer counterparts. These sound absolutely lovely; that combination of rhubarb and ginger is so good. Just CH checking in here to confirm the delicious, tastiness of said tarts. Nom nom! The tarts look wonderful and my dad happens to be a huge rhubarb lover – I might have to make these for him sometime, I am sure he would love them! Sounds delicious – great flavour combination. I really like the new website – very fresh! As a child I was the only girl with what seemed like dozens of male cousins, so I spent my childhood climbing trees and playing football and cricket! My favourite colour was blue! I am now making up for it by having an extended pink phase in my sixties! The tartlets look wonderful. Rhubarb and ginger are two of my favourite things and With the frangipane topping I feel compelled to go and bake some immediately! Love a bakewell tart, and the rhubarb is so pretty! I also think a compote would work really well. Lovely recipe as always. Thank you. Isn’t rhubarb beautiful. I still have some leftover jam in my fridge which I’ve been stirring into porridge. Delish. Your new site looks fantastic, well done! 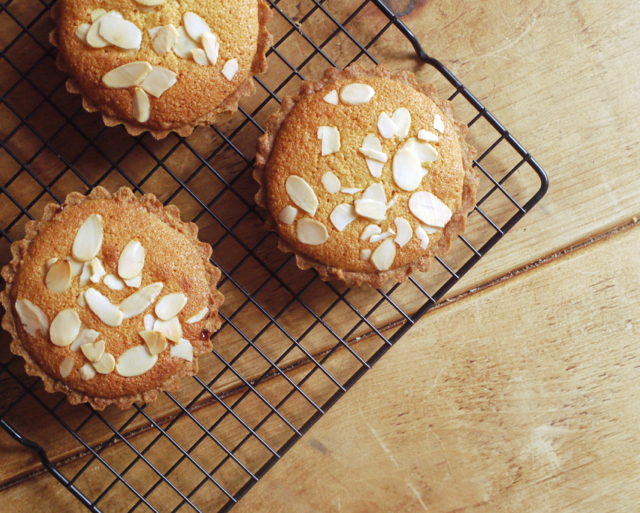 The little tarts look divine too! I love rhubarb but from what I can recall, I’ve only ever cooked with it in crumble or in ill-fated cocktail recipe. I don’t suppose you grow your own? I’m (finally) getting a garden next month when we move house and would love any tips. What pretty little tarts. I just love the beautiful vibrant pink of forced rhubarb. It’s so pretty. 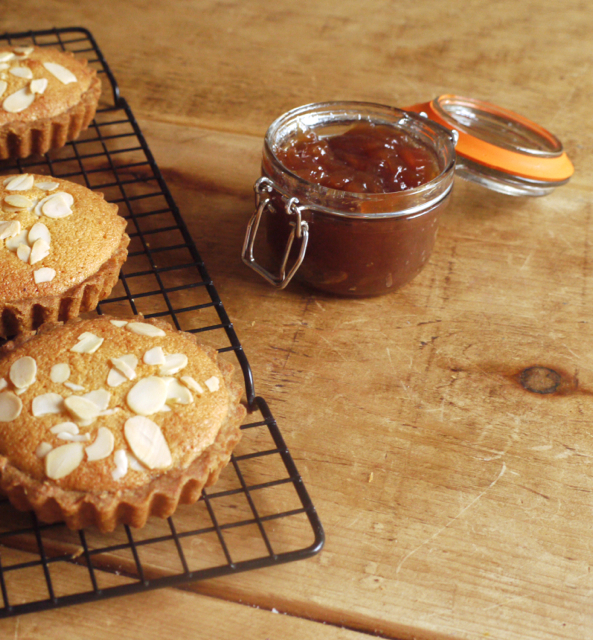 Rhubarb… almonds… I think I’m in love! Fabulous! Am always looking for rhubarb recipes. This is perfect. I love the idea of adding ginger to the rhubarb for an extra kick. These look gorgeous! Oh my gosh, just reading the title for this post got me salivating! What adorable little tarts. Thank you! Perfect for this time of year too when there’s so much rhubarb about.